RC Silfies Zombie Float wins Judges Choice. 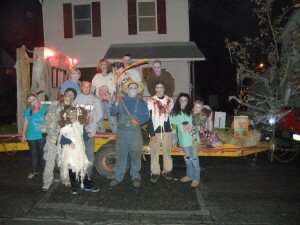 The winners of the 2012 Bath Firefighters Halloween Parade were announced earlier today by parade Chairman Glen Butz. The winners were chosen by three local “Celebrity Judges” Mrs. Fiorella Mirabito, Mr. Barry Fenstermaker and Mr. Zee Bartholomew. Categories included Best Appearing Small Group, Best Appearing Large Group, Best Appearing Float, Winning Cub Pack/Boy Scout Troop, Winning Brownie Troop/Girl Scout Troop and the Judges Choice Award. The parade, which started at Main and Broad Streets, lasted a little over an hour and was full of great entries. Next articleGLVCC Nazareth Chamber Office Grand Opening and Ribbon Cutting a Huge Success!